May 4, 2010 - The Atlantic City International Airport, located at the FAA's Technical Center, is the first in the national airspace system to deliver digital notices to airmen (NOTAM). NOTAMs provide computer-generated safety information to pilots and air traffic controllers about conditions at an airport such as construction and hazards. Atlantic City started using the new system on April 20. "Digital information management is key to meeting the air traffic system's safety and efficiency goals," said FAA Administrator Randy Babbitt. "This is yet another step the FAA is taking to modernize the national airspace system." Digital NOTAMs have safety and efficiency benefits over traditional NOTAMs. They can be transmitted to all air traffic management systems simultaneously - so everyone gets the same information at the same time. The information is integrated into cockpits and air traffic control systems. "It provides one stop shopping for airspace system changes. It's a great benefit to commercial airline dispatchers who need to quickly assess what's affecting their operations," said Babbitt. With the new digital system, airspace users get easier to read information that goes directly into computer systems that map the information and assist pilots with identifying NOTAMs that affect their particular flight. Traditional NOTAMs use all uppercase lettering, contain contractions and use non-standard phrasing based on legacy teletype systems. Also it is difficult to integrate traditional NOTAMs into maps and other graphical aids that would assist with pilot and controller situational awareness. 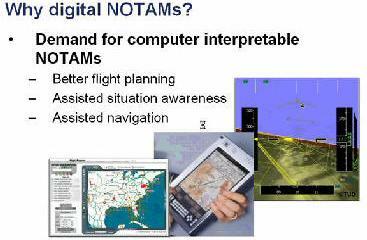 Another advantage to the digital NOTAM is that the originator of the NOTAM can input the NOTAM information. So, an airport operator can report airport conditions directly to the NOTAM system instead of relaying the information to a specialist who would manually type the information. That process can leave too much room for error and can be time-consuming. Pilots will get quicker and more accurate information with this new system. Other airports that will follow the lead of Atlantic City International include: Washington Dulles, Reagan National, Baltimore-Washington International, Richmond, Norfolk, Denver, Chicago O'Hare and Midway, Memphis, Fairbanks, Alaska and Ft. Wayne, Ind.